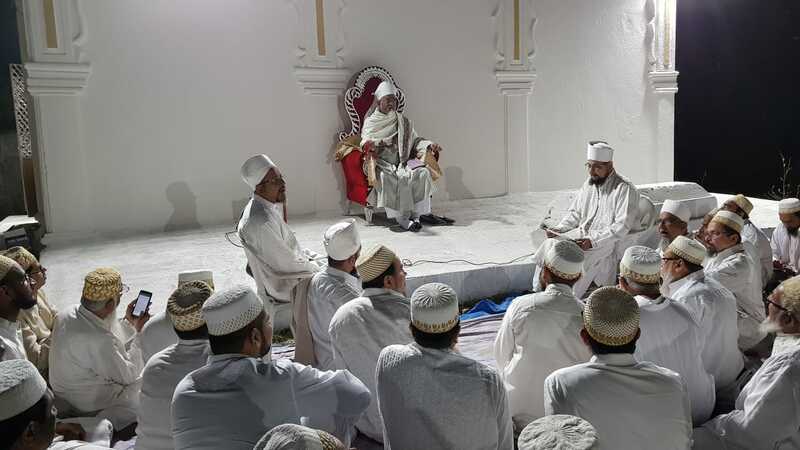 With the 'Urs Mubaarak of 31st Da'i e Mutlaq Saiyedna Hasan Badruddin bin Saiyedi Wali saheb (qr), his wasiyat to migrate Vadodara from Ahmedabad comes afresh in the minds of Mumineen. This was his 350th 'Urs Mubaarak and his Rawzah Mubaarakah was newly painted and everything thing was perfectly organized so that mumineen could easily do ziyaarat of Muqaddas Maulaa. 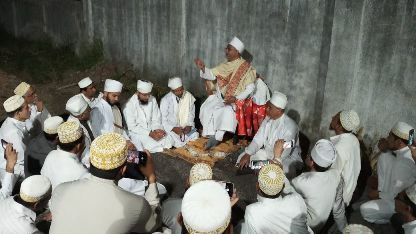 Aqaa Maulaa offered Maghrib-'Ishaa namaaz in Masjid e Haatemi and then directed mumineen to sit outside Rawzah for Behram majlis. During his bayaan Aqaa Maulaa said that, "We should always remember our A'immat e Taahereen when after the death of our 5th Imaam Maulaana Ja'far us Saadiq (as), several of our Imaams remained in Satr-Hiding for 150 years because of the constant threat and harassment from the enemies. Our Imaams went to Tashkent, Farghana, Sijilmassa and Salamiya until 11th Imaam Maulaana 'Abdullaah al-Mahdi emerged victorious and revealed himself in Tunisia and built a city called al-Mahdiyah." On 19th Rabi' ul Aakhar, the day of Muqaddas Maulaa's 'Urs Mubaarak, Aqaa Maulaa went to Nadiad in the evening. Maulaa offered Maghrib-'Ishaa namaaz in Masjid e Faatemi and then after mumineen-muminaat offered Bay'at e Imaam uz Zamaan (as) to Aqaa Maulaa. Maulaa addressed the gathering with Naseehat and said that, "Zulfiqaar is the Ejaaz of Maulaa Ali (as) and it acts like Misaaq. Those who will follow it will be spared by Zulfiqaar and who will go against it will have to face its fierce attack. Getting Jannat or Jahannum is based on how one follows the Misaaq of his Maulaa. Ali's sword and Musaa's stick is sufficient to decide who is Mumin and who is Kaafir. Rasoolullaah (saws) has opened the gates of Paradise on 18th Zul Hijjah, 10 AH, at the place of Ghadeer Khumm by appointing Maulaa Ali (as) as his successor, but very few of them realised this and the majority laughed out and rejected this opportunity and due to their hypocrisy became the dwellers of hell." 18-19 Rabi' ul Aakhar 1439/5-6 January 2018, Aqaa Maulaa visited Ahmedabad and Nadiad during the 'Urs Mubaarak of Muqaddas Maulaa. 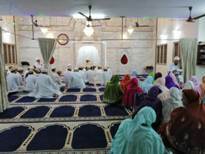 Maulaa offered Namaaz-e-Imaamat in Masjid e Haatemi and Masjid e Faatemi. Maulaa delivered memorable bayaan at three places in Ahmedabad. 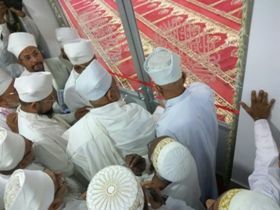 Near the Rawzah Mubaarak of 3 Alavi Du'aat, Saiyedna Jalaal Fakhruddin saheb, Saiyedna 'Ali Shamsuddin saheb and Saiyedna Hasan Badruddin saheb. In Nadiad, Maulaa did necessary nasihat to Jamaa'at mumineen-muminaat and said that, "Safeguard your children and keep an eye on them and guide them at every possible misleading point. Being parents your responsibility is bigger then the dreams and career of your children." The 348th ‘Urs Mubaaraak of 31st Da’i e Mutlaq Saiyedna Hasan Badruddin bin Saiyedi Wali (aq) in Ahmedabad on 18-19 Rabi ul-Aakhar 1438 AH, Mon-Tuesday saw an unprecedented presence of Mumineen. This was because Huzoor-e-‘Aali Saiyedna Haatim Zakiyuddin saheb (tus) did Iftitaah-e-Sa’eed (inauguration) of Haatemi Masjid located behind the Musaafir-khaana. During the majlis of Takht-Nasheeni of Aqaa Maulaa on 20th Sha’baan 1436 AH in Nooraani Masjid, Muqarrib ud-Da’wat il-‘Alaviyah Ghulaam Husainbhai Alibhai Contractor took Razaa to construct a Masjid for the Isaal-e-Sawaab of his parents. By the Du’aa of Aqaa Maulaa and constant efforts of Ghulaam Husainbhai, after the necessary permissions from Administration, Aqaa Maulaa performed the Rasm-e-Ta’sees (laying of foundation stone) on 9th Sha’baan 1437. In the short period of 8 months, the building which houses a Masjid and a Hall got completed and Aqaa Maulaa granted Razaa for its Iftitaah on the Miqaat of ‘Urs. Huzoor-e-‘Aali Saiyedna saheb (tus) along with Hudood became mehmaan-e-khusoosi of Ghulaam Husainbhai where Maulaa gave very important Hidaayat to his family members which they all should take care of collectively after the Iftitaah. On this day of Shab-e-‘Urs of Muqaddas Maulaa Saiyedna Badruddin saheb (aq), 18th Rabi’ ul-Aakhar, Monday, Aqaa Maulaa did Rasm-e-Iftitaah-e-Sa’eed of Haatemi Masjid where large number of mumineen did ‘Ayni Mushaahedah. Hudood recited Aayat Kursi and at the door of Masjid Huzoor-e-‘Aali Saiyedna saheb (tus) recited Surat ul-Fath. Everyone present uttered ‘Subhaanallaah’ which echoed the entire masjid when Aqaa Maulaa proceeded towards the Qiblah. Qiblat ul-Mumineen went to make the meaning of Qiblah evident. In the beginning of the majlis, Ra’s ul Hudood (zi) recited the Bayt “Lahu Da’wat ul-Haqq” composed by Mukaasir ud Da’wat (dm) in the Shaan and Fazeelat of Da’i uz Zamaan (tus). Huzoor-e-‘Aali Saiyedna saheb (tus) did Imaamat of Maghrib and ‘Ishaa il Aakherat namaaz and in between it, namaaz of Tahiyat ul Masjid was offered. Zaakereen-e-Da’wat Hadd saheb Qambarali bhai and Mulla Husainali bhai presented their Khusoosi Kalaam in which the Bayt, “Che Aaje Iftitaah Allaah na Ghar nu, Aa Ghar che Khaaliq-e-Jinno Bashar nu,” composed by Mukaasir ud Da’wat (dm) too was recited. On the day of ‘Urs, 19th Rabi’ ul-Aakhar, 17-1-2017, Tuesday, Muqarrib ud-Da’wat il-‘Alaviyah Mazharali Badruddin Contractor invited Aqaa Maulaa and did Qadam-bosi in his newly built factory. A majlis was held there and Aqaa Maulaa did Du’aa for Barakat and Taraqqi in business with Rizq-e-Halaal. In the same Estate Nanabhai and Ghulaam Husainbhai also took this Golden opportunity and took Qadam Mubaarak of Aqaa Maulaa in their factories. In the big gathering of the workers Aqaa Maulaa and naseehat and Du’aa for Imaan-daari and Wafaa-daari. On the ‘Urs Mubaarak of 31st Da’i ul Mutlaq Saiyedna Badruddin Hasan bin Saiyedi Wali saheb (aq) in Ahmedabad on 19 Rabi’ ul-Aakhar 1437, 28-1-2016, Huzoor-e-‘Aali Saiyedna saheb (tus) sitting in the Rawzah Mubaarakah of 28th Da’i ul Mutlaq Saiyedna Shaikh Aadam Safiyuddin saheb (aq) near the Qabr-e-Anwar of 29th Da’i ul Mutlaq Shaheed-e-‘Aazam Saiyedna ‘Ali Shamsuddin saheb (aq) along with Hudood and Mumineen did Bayaan-e-khaass and Du’aa. Maulaa said that, “A Mumin who do ziyaarat of these Du’aat are in the nooraani company of Malaa’ikat-Angels and and he himself becomes an angle gaining the shafaa’at of our Du’aat. The Door of this Rawzah is “Baab-e-Hittah”, meaning the door to Najaat because mumin completely safeguards his walaayat and ‘aqeedat towards his lifetime. The Rawzah of our Du’aat is the centre for Haajat-rawaai for all those who take Maulaa’s Waseelah.” Maulaa quoted the description of a Khwaab in which a mumin saw the Supremacy and Sublime status of our Du’aat in Ruhaani ‘Aalam over all others and their position as a Gadaa and Ghulaam in the Hazrat of our Du’aat. 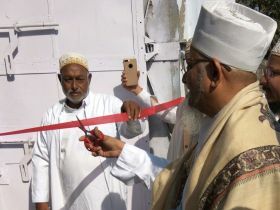 Accepting the izn of Nadiad Jamaa’at, Mazoon ud-Da’wat Saiyedi saheb (dm) on 18th Rabi’ ul-Aakhar 1435 AH, Tuesday along with Hudood-e-Da’wat went to Nadiad and did Iftitaah (opening) of the shop, took misaaq (ruhaani oath of allegiance) and did naseehat to Nadiad mumineen at Faatemi Masjid. Mumineen-Muminaat were naseebdaar to hear from Mazoon Maulaa the importance of the Sunnat of Misaaq, its obedience, requirement and principles. They heard the tareekh of 21st Faatemi Sartaaj Maulaana Imaam Taiyeb (as) with great interest and deep ‘aqeedah. 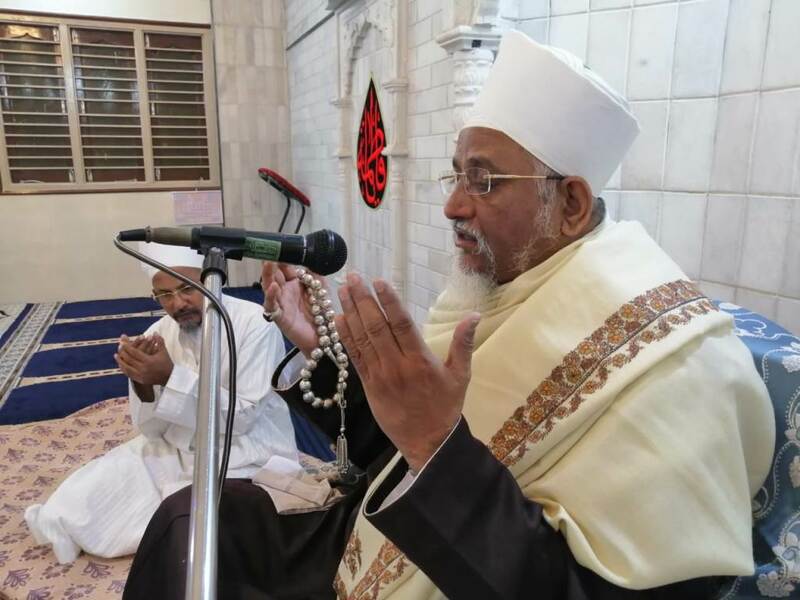 At Ahmedabad, after the namaaz of Maghrib, in the majlis of shab-e-‘Urs, Mazoon Maulaa stressed on the essence of Haqq, the hardships to follow it and the falsehood of its enemies. Du’aat in their full capacity during their life-time never compromised in urging mumineen to embrace Haqq either openly or secretly. Mo’jezaat of Shaheed-e-Aa’zam is manifest among mumineen and the Yaqeen-o-Imaan of mumineen for Da’i ul-Haqq is always alive but hidden in their hearts. On the day of ‘Urs Mubaarak, after the Fajr namaaz, Mazoon Maulaa along with zaa’ereen went for the Ziyaarat of Saiyedna ‘Ali saheb (aq) and there in the Rawzah recited Surah Yaa-Seen, then went for the Ziyaarat of Saiyedna Jalaal saheb (aq) and lastly did Ziyaarat of Muqaddas Maulaa where Qiraat ul-Qur’an, Sadaqallaah, Qaseedah and Faatehah-khwaani was conducted. Clip 2 Saiyedna Badruddin saheb (aq) played a centre-stage role in putting forward the truthfulness of the martyrdom of Saiyedna Ali saheb (aq) before the court of Sunni rulers in the most turbulent times and adverse atmosphere when Maulaa was forced to live beneath the earth for the long period of 17 yrs. We can feel the pain of helplessness and oppression by reading the composition of his poetry known as Diwaan-e-Hasan. 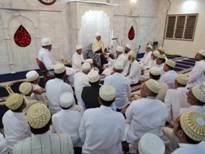 During the time of 43rd Da’i ul-Mutlaq Saiyedna Yoosuf Nooruddin Saheb (aq), mumineen of Nadiad shouldered the responsibility of arranging the Behram and Urs of Saiyedna Badruddin Hasan bin Wali (aq). It was a custom that all the mumineen of Nadiad used to come to Ahmedabad on this occasion. 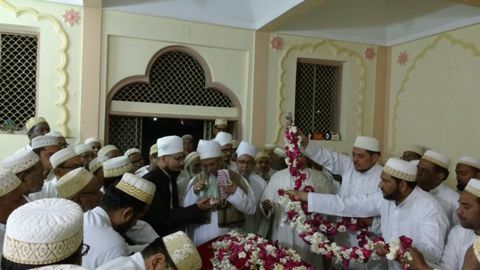 Saheb-e-Da’wat along with the mumineen of Vadodara went to Ahmedabad for the Ziyaarat on the occasion of 343rd Urs Mubaarak of Saiyedna Badruddin Hasan bin Wali (aq) on 18th Rabi’ ul-Aakhar 1433 / 10th March 2012, Sunday. In the Bayaan of Behram of Muqaddas Maulaa Saiyedi Mazoon Saheb (dm) reminisced the hostile circumstances in which our Maulaa executed the obligations of the Da’wat in Ahmedabad. He had to face the challenges and attacks from three sects at that time. He remained in the underground cellar for about 18 years guiding the mumineen to the righteous path of Allaah. Mazoon Maulaa emphasized on the importance of knowing the historical accounts of our Du’aat in Ahmedabad in 11th century AH. It is because of their sacrifices that our community is existent today in Vadodara. He highlighted the Diwaan-e-Hasan written by the Muqaddas Maulaa in the praise of the governors of Mughal rulers who helped him in every possible way. It was he who represented the existence of our distinguished minority community to the then rulers of Ahmedabad. On the day of Behram of Muqaddas Maulaa Saiyedi Mazoon Saheb (dm) along with the Hudood of Da’wat went to Nadiad where the Misaaq of mumineen was taken by him in the Faatemi Masjid. After halting for sometime at the residence of Shamsuddinbhai Kagdi, where the Sadaqallaah of his mother was recited, the Majlis of Misaaq was assembled at the Masjid. All the mumineen of Nadiad gathered at the Masjid. Maazoon Saheb (dm) did the Bayaan highlighting the importance of Misaaq and praised Allaah that the blessing of Masjid has been bestowed upon the mumineen of Nadiad, though few in numbers – only 19-20 families. He stressed that Saheb-e-Da’wat has come to Nadiad after 2 years. Huzoor-e-‘Aali (tus) had come to Nadiad at the time of Iftetaah of the masjid five years back. The gathering of all mumineen of Nadiad must be done in the presence of Saheb-e-Da’wat every year. Lunch was arranged for the mumineen after the Zohr-‘Asr Namaaz. Saiyedna Badruddin Hasan bin Wali saheb (aq), the 31st Da’i al-Mutlaq al-Alavi, did khidmat of Saiyedna Ali bin Ibraheem ash-Shaheed (aq) and Saiyedna Zakiyuddin Saheb (aq) whole-heartedly with full dedication and sincerity which gained him the status and rank of Mukaasir in the last days of Saiyedna Ali (aq). 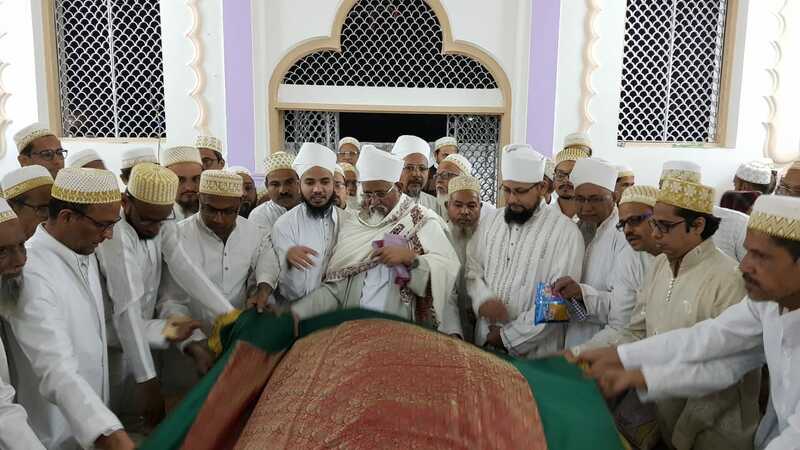 He was then ascended to the martabah of Mazoon during the time of Saiyedna Zakiyuddin Saheb (aq). He is the only Da’i ul-Mutlaq of India who stayed in the basement beneath the ground (called in the vernacular language as taaka) for a long period of 17 years due to the khawf of mukhaalefeen and harsh political circumstances. He used to carry out the responsibilities of Da’wat through his hudood and accordingly guide the mumineen in the most challenging times when they were under threat by the ferocious enemies. 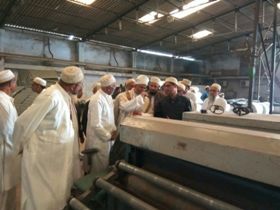 Sensing the seriousness of the religious scenario in Ahmedabad where the life and livelihood of Alavi mumineen was frequently targeted and subjected to unbearable oppression, Muqaddas Maulaa ordered his Mazoon Saiyedna Ziyauddin saheb to prepare mumineen for the migration towards the peaceful land where the barakat of Da’wat would ascend and the jama’at of mumineen would flourish. Vadodara, the birth place of Saiyedna Ali Saheb (aq), the place of peace and tranquility, was selected as Daar ul-Hijrah. Muqaddas Maulaa did wasiyat to 32nd Da’i ul-Mutlaq Saiyedna Ziyauddin saheb that, after his death he should no longer stay in Ahmedabad but migrate to Vadodara along with Da’wat khazaana, ahl-o-ayaal, hudood and mumineen. He instructed him to establish the markaz and seat of Da’wat-e-Haadiyah in Vadodara. During his stay in taka where he confined himself from the eyes of commoners and only some hudood were aware of his whereabouts, made unparallel composition of qaseedahs (eulogy), maraasi (elegy), naseehat (admonition), fazaa’il (merits) in Arabic language which later came to be known as “Diwaan-e-Hasan”. It comprises of the details reflecting the contemporary events, political up-downs, relations with Mughal dominion, proof of the truthfulness of Da’wat-e-Alaviyah, merits of Ahl ul-Bayt (as), halaal-o-haraam, allegorical description of the Da’wat of Sauyedna Jalaal, Saiyedna Dawoodain, Saiyedna Safiyuddin, Saiyedna Ali and Saiyedna Zakiyuddin saheb qaddasallaho arwaahahum. This Diwaan is a great legacy for us as it is a autograph copy written by the mubaarak hands and beautiful khutoot (handwritings) of Muqaddas Maulaa which makes us realize the ilmiyat and ruhaaniyat of Muqaddas Maulaa and refreshes the harshness of the life of that testing time in which our Muqaddas Maulaa stood determined for the cause of haqq and imaan. Copyright © 2019 Alavibohra.org. All rights reserved.